All Android mobiles have a serious security issue, apple is too expensive, windows is getting better and Blackberry is the most secure and smooth OS. If you dont play games, you dont need Android, period. That simple. If you are in sensitive business or government, there is Blackberry or Apple. Best reception is the same, with perhaps the S5 in there are well. So WP has a big future opportunity in the mid range mobiles. AnonD-362259, 10 Feb 2015No Asus? Seriously, GSMArena? Your site is my one-stop-shop for news and guides about the mobi... moreI guess Asus phones were not included cause they are not available internationally meanwhile Huawei is .By the way do you know how many smartphones are equipped with intel processors(except asus)?4 if i'm not mistaken. I understand why the htc one(m8) was left out but the htc one(m8) eye deserves a mention for the 13mp camera and its less pricey then the 4up htc. No Asus? Seriously, GSMArena? Your site is my one-stop-shop for news and guides about the mobile devices. Yet this article seems to fail it's purpose. Easy to buy? Are you kidding me? The €100-€200 range should have been dominated by the three Zenfone 5 versions. "2013 and late 2014 models are safe - they are already well- priced" - So why include the obviously over-priced HTC Mini 2? The design? Bang-for-the-buck but you're considering the design? Shame on you! I also noticed that all phones listed had processors based on ARM. You have something against Intel? Or is it inline of something like a business model... No purpose in mentioning or making a full review for a device whose company doesn't "support" you? I have been a loyal reader since the time you had that crappy layout from 6 years ago. I bought my old Samsung S8000 Jet because of the great review I read from here. That said... I demand an explanation! I think low to mid range the nokia/microsoft phones are the best value wise.For example 635 has a 4.5 inch screen with clear black tech and gorilla glass 3 quad core processor and 512 ram equivalent with 1 gb on android , 4g network and really good battery life and all those for under 100€.Windows may not be so popular but a lot of people buy these phones as a second phone or for work as they are easy to use,smooth and straightforward ui.I would like to add that not many europeans will buy a chinese phone like Xiaomi(just because of the name i guess cause a lot of carriers sell chinese phones branded under their name )and Motorola phones are kinda hard to come by just like Oppo or OnePlusOne. Anonymous, 10 Feb 2015HTC One M8 cast aside, despite the stellar reviews from other reputable websites last year. They wrote the reason for not including M8 and S5. As S6 and M9 are coming and they'll get a price cut. Now is the worst time to buy them. What does GSMArena have against ASUS that the clear-cut, bang-for-the-buck Zenfones 4 and 5 are rarely on their buyer's guide, if ever at all? Shame u forgot arena one superb smatrphone..
HTC One M8 cast aside, despite the stellar reviews from other reputable websites last year. Very nice article. Many Android people feel pain why GSM arena included Lumia phones in all categories. Answer is in article itself read once again. They clearly mentioned why they considered particular device. More over many Android won't get lollipop update so they excluded that devices. Whereas all Lumia devices are already running WP 8.1 and will get windows 10. If you ask me GSM arena by mistake included some old 4.3 devices. I don't know why ? ( they didn't include Lumia 520 which is with latest version denim. ) but okey nice any very informative article. The Galaxy Alpha is awesome, specd enough and not unnecessarily high and design wise I like it a lot. The one real con is not mentioned, though: the battery is aweful. Even in saving mode, when 4G is always on and I use it to read newspaper (apps) for two hours a day, do some fb, maybe take a Picture sometimes, the battery will barely last a working day (12hrs). Anonymous, 10 Feb 2015I wonder why Lumia 535 is one of the recommended phone, while it has serious problem with the ... moreUnpopular doesn't mean bad though. Windows phones provide great hardware for their price. Moreover many people are looking to switch to windows due to windows 10. I had migrated to Lumia 730 dual sim and wow no cons for Lumia 735! I wonder why Lumia 535 is one of the recommended phone, while it has serious problem with the the touch screen sensitivity. 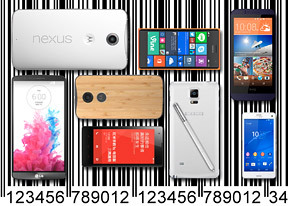 Several good android candidates are missing like Galaxy S4 GPE, but almost all categories do have two Microsoft phones. WP is unpopular, so why so many recommendations? Waiting for all the "where's my phone?" whiners to comment.